After over 15 years of religion classes, it still surprises me that there are some really basic stuff that I don't know. For example, we have always known that the Lenten Season is 40 days. However, when I trace the dates back in the calendar (Counting 40 days from Good Friday), they never match.And I just learned last weekend that: the Lenten Season actually DOES NOT include the Sundays within. Which is also called the "cheat day", if in case there is something you are giving up for the season, which in my case is sweets. Sweets are never really healthy, thus, this sacrifice is also taking better care of the physical being given to me. But it is especially hard to give up, especially for a sweet tooth like me. 1. Dip Fish and Prawn pieces in egg, then in cornstarch, clapping away any excess. Fry in hot oil until cooked. Set aside. 2. Drain fruit cocktail of all liquid, set aside. 3. 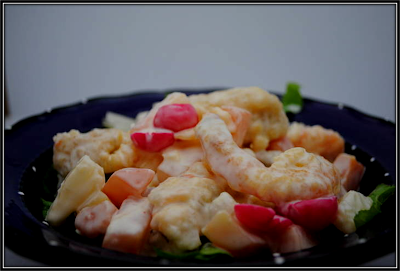 Mix together mayonnaise and condensed milk, pour over fruit cocktail, mix together fish and prawn while still hot. 4. Serve on top of a bed of chopped romaine lettuce.